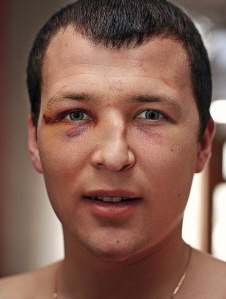 A broken nose (also called a fractured nose) is a common injury after a knock to your face. Broken noses are usually swollen, red, and sore. If your nose is broken you may also have bruising, cuts, or a bleeding nose. Your nose might look bent or you might find it hard to breathe through your nose. What should I do if my nose is broken? If you don't have any cuts to your skin and the cartilage between your nose isn't broken, you might not need any medical treatment. However, to help ease the swelling, hold an icepack against your nose for 15 minutes, around once an hour, for the first few days. (Make sure there is a cloth between the ice and your skin, so you don't damage your skin.) The swelling will usually go down after a week, and the bruising will go in about two weeks. a blood clot or swelling inside your nose between your nostrils – this may be a septal haematoma, which needs to be drained promptly. you have a severe headache, neck pain or a stiff neck – especially if you have numb or tingling arms, blurred or double vision, or other symptoms of a severe head injury, such as loss of consciousness or repeated vomiting. See your GP as soon as possible if you are worried about anything. If you need treatment by an ear, nose and throat specialist (also called an ENT or ORL doctor, or an otolaryngologist) it will be most successful if done within a week or two of your injury. It's unlikely you'll need an X-ray of your broken nose, but if your doctor thinks another bone in your face may be broken that may be a reason to have an X-ray. If your nose is severely broken, you may need to get it straightened (realigned) by an ORL (or ENT) doctor. The doctor might suggest you wait until there is less swelling before doing this, and this could take up to two weeks. Usually, you will be given a local anaesthetic that can numb your nose for two to four hours before straightening. But occasionally someone with a very severely broken nose needs a general anaesthetic (you go to sleep during the operation) to have their nose straightened. If you are unhappy with either how you are breathing or the shape of your nose, ACC might cover the cost of private surgery. Talk to your doctor about this.